This marks the 4th week of #MedievalMonday ‘s via various social media platforms. We have already seen participants reach thousands of users over multiple networks, and have seen posts from a half dozen Kingdoms across The Society. Today I’m posting just a select few of the posts Easterners have made over the last 4 Mondays. What is #MedievalMonday you ask? It’s a hashtag campaign taking place via Facebook, Google+, Twitter, and Instagram. What is the goal of the #MedievalMonday campaign? It’s goal is to have fun, while sharing some of the cool photos, articles, and videos highlighting the best parts of our shared Medieval hobby. When posters make their posts public, these photos and other items can be re-shared, liked and commented on, and increase awareness of our hobby. How can I participate in the #MedievalMonday campaign? It’s super-easy! If you would like to post, just make a public post of a photo of a medieval object you’ve recreated, that you took at an event, or share a video of your favorite medieval song on youtube, or your favorite go-to medieval recipe with a link. Then in that post, type “#MedievalMonday” and hit post! It’s that easy, and can be done on any major social media platform. I don’t have anything to post, what else can I do? Even easier than posting, just search “#MedievalMonday” on your choice of social media platform, and voila, there are posts! Like posts you appreciate, comment on ones you truly enjoy, and re-share public posts that you want your social media circles to see. Last Monday was the first time I announced the hashtag campaign for #MedievalMonday, and a number of people from across the Known World rose to the occasion. The campaign even got noticed by the Society Minister of Arts & Sciences, Master Raven Mayne, who encourages everyone to get on board. The other, and very important key, is that this happen on Mondays. Why Mondays? Because alliteration makes things easier to remember, and because when multiple people post using the same hashtag, on the same day, it increases exposure. You may also wish to use ‪#‎SCA‬ and ‪#‎MySCA‬ the latter being the Society FB Page’s on-going hashtag campaign. Well, first and foremost, it’s a positive form of outreach to spread awareness about cool medieval stuff. Second, as your images get posted, liked, commented on, re-posted, and re-shared, more and more people are exposed to them. Through my minimal efforts on Instagram, I’ve already attracted in a few people into the SCA; albeit in other Kingdoms so far, but new members are a good thing no matter where they’re from. If you’d like to find some of what’s already being posted, it’s easy to find. Just type #medievalmonday into the search bars at the top of your facebook page, Google+ page, twitter, or instagram feed and the posts will display. Don’t forget to like and comment on your favorite posts. Even if you don’t have something to share this week, liking and commenting on other people’s posts increases its exposure to others, and supports the content creator/broadcaster. Remember to have fun, and share something cool about this amazing time period! The Society Social Media Officer is seeking a Deputy Social Media Officer for Facebook / Emergency Deputy. This position will require 5-10 hours per week researching and generating content for our official Facebook Page, including links, news items, status updates, photos, and shareable content. The Deputy for Facebook will work with the Facebook content and moderator team, will serve as a collaboration lead for the other Platform Deputies, and will also serve as an emergency deputy for the Social Media Officer. The ideal candidate has excellent written communication skills, excels in creative thinking and content creation, and has a comprehensive understanding of the guidelines set forth in the Social Media Policy. To apply, send modern and SCA resumes to socialmedia@sca.org and cc: president@sca.org. Applications are being accepted through Friday, December 6. Looking for a place to trade goods and services? How about somewhere to meet other families with children? Or a place to chat about your latest project? Look no further than Facebook, where more groups are appearing every day. Here are some that we have come across, be sure to add others in the comments! The following announcement comes from the Elmet Herald, the East Kingdom’s Heraldic Education Deputy. Greetings from Yehuda ben Moshe, Elmet Herald, the East Kingdom heraldic education deputy. I will be running the next East Kingdom Herald University (EKHU) class next week. Unto the populace of the east kingdom does Ryan Brigantia send greetings. In recent weeks there has been a flurry of comments and posts regarding the use of Social Media, including the adoption of the SCA Social Media Policy. While I, personally, am very active in many different outlets of Social Media such as Facebook, Twitter, G+, and YouTube I do not plan on creating an official presence of the Brigantia Principal Herald’s office on any of those entities during my tenure as Brigantia. All of the above listed social media sites are not secure, no matter what their Security Policies state, and data can, and does, get removed by those social media sites without warning and/or can be used by third parties without permission of the poster. I will continue to support and encourage unofficial court reports published in the EK Gazette and the East Kingdom social media groups at the discretion of the Vox Regis and the Crown. Email will remain, as it has been for years, the only official electronic communication method of the Brigantia Principal Herald’s Office. Know that you can contact me through social media for discussions regarding any topic but any official discussion will ultimately have to be summarized in an email. Going forward quarterly territorial group herald reports will not be accepted through social media. Official court reports will NOT be accepted through social media. They will only be accepted using the forms available on The East Kingdom College of Heralds website, through email, hard copy mail, or hand delivery. Similarly, the Eastern Crown Herald has stated that the forms for submission of names and armorial will only be accepted through email, hard copy mail, or hand delivery. With the expansion of our great Kingdom moving into the technical age, Eastkingdom.org will require some extra assistance. The East Kingdom Web team is looking to start two new groups of gentles that can assist with moving forward with new technology. The first is a group of gentles who have technical experience with WordPress. The duties of these positions will be to assist webministers who are using WordPress and are having technical issues. These gentles will provide assistance, advice and suggestions when needed. The second group would become webministers at large. Qualified gentels will need to have experience in the technical side of web sites, maintaining the web site when needed, assisting other webministers, and becoming a warranted webminmister of the East. Last week SCA, Inc. released it’s new Social Media Policy. The East Kingdom Webminister’s office has clarified a few things and also offered a few more details in regards the East’s presence on various Social Media outlets in this open letter to the populace. As much as the Gazette would have loved to send its intrepid reporter across the kingdoms to fair Atenveldt, Baroness Leonete spent Saturday in the frigid north, waiting for news from the BoD meeting to inform you, our dear readership as to the goings-on of our great and noble society. As was already reported in the Gazette, The Shire of Endewearde was approved to become a Barony. The news filtered from the Gazette to the populace at Birka, creating much celebration among the members of the newly created Barony. The Social Media Policy was approved, on its fourth draft. 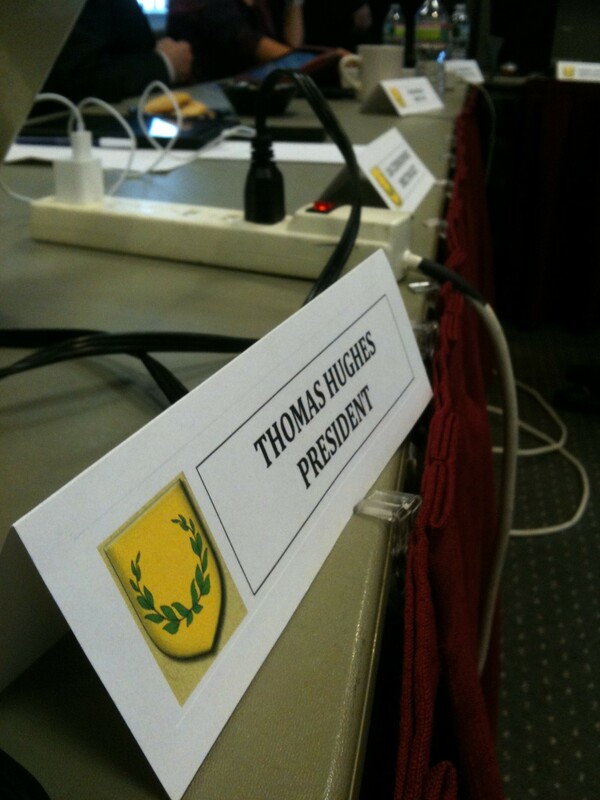 Stay tuned for another feature with Tobias Morgan, Deputy Society Seneschal for Social Media. A new Kingdom Seneschal’s Handbook was also approved, pending changes suggested by the BoD. The BoD discussed the creation of a Society-wide Lifetime Achievement Award, which was also referenced as a “Hero of the SCA” award. BoD member Marc Faulcon discussed the idea to create a structure of recognition that cuts across kingdom, state, and international boundaries to create a kind of hall of fame of those members of the society who truly make a difference. The BoD plans to use social media to gauge the interest of the populace on this idea, and then form a committee to look into it. Another new project of the BoD is a youth and family badge system to encourage participation from younger SCAdians. This system will have activities to keep children engaged and be broken into three age groups. The material for the activities will be similar across all kingdoms and be managed at the corporate level. The current plan has 7 topic areas across 3 age groups for a total of 21 badges. More information about this initiative will be forthcoming. The BoD is looking at creating more oversight for the largest wars. This will affect events of over 2,000 people and needs to include evacuation procedures, water sanitation procedures, and other considerations. There is also a need for financial oversight when events are handling monetary amounts over $75,000. The need to look into these items is coming from both insurance and legal counsel, as well as the BoD itself. In another reminder of how real life politics affect the SCA, the BoD created a new policy prohibiting marijuana at all events, even in states where it is legal. Because federal law prohibits it, the SCA will do so as well. Many thanks to Lady Astrina de la Meuse for providing notes, and to Don Wyllym for canvassing Atenveldt to find us a note-taker. The Board of Directors has approved the social media policy which was created by a working group of Society and Corporate officers starting in early 2012. For more about the approach that the SCA is developing for social media, see the Gazette’s interview with Lord Tobias Morgan, Deputy Society Seneschal for Social Media.